Schizophrenia is a chronic mental disorder that results in severe impairment in many areas of brain function. This disabling mental condition hampers the ability of a person to distinguish or differentiate between reality and illusion. The onset of clinical signs and symptoms may initiate as early as late teen years. Till date, the exact cause that disrupts the balance between emotion and thought process (seen in schizophrenia) is unclear. However, medical researchers believe that genetic and environmental factors are closely involved in the development of this complex mental illness.Let’s go through the typical symptoms seen in such patients. People suffering from a psychotic disorder, such as Schizophrenia experience negative changes in relation to their social skills. He or she may find it difficult to interact with friends and/or family, resulting in few or no friends at all. This is because of the varied trouble they have in engaging in any type of conversation. In fact, such people prefer being alone than spending time with known or unknown people. Even whilst conversing, they speak with hesitation, halt at frequent intervals and do not find it comfortable to make any eye contact with others.Not just that, such affected individuals seem to have little or no empathy for their near or dear ones, which can be gauged by the absence of facial expressions or emotions. However, one must try to understand that schizophrenics can feel the full spectrum of emotions but fail to vent them (when needed). In extreme cases, feelings of distrust as well as social isolation may be seen too. One of the many negative symptoms seen in Schizophrenic patients is the impaired ability of living a normal life or routine. Very often, such people seem to fully lack motivation to love or work independently; even activities they were a part of become tough to carry out. This type of behavioural symptom is called avolition. Quite obviously, this does have an ill effect on both, personal and professional relationships. This is probably the reason why barely ten to twenty percent of all schizophrenics are in a position to retain part time or full time jobs. Also, people living with this disorder are unable to formulate plans or follow them which may increase the chances of mental depression too. Delusions can be best explained as illogical beliefs or thoughts that do not share any link with reality, whatsoever. They usually surface from miscomprehension of experiences that take place for real. Of the various types of delusions noticed in schizophrenics patients, Presecutory delusion is the most common. In another type of delusion, known as Referential delusions, patients hold the belief that all the people around him or her are either talking or mocking them. If you know someone living with schizophrenia, you must have noticed that they frequently exhibit speech deferment. This happens as their disorderly mental thinking severs their capability of forming comprehensible sentences.Many a time, he or she may lose track of the ongoing conversation or may give unrelated answers to the questions asked. Their incoherent way of speaking (which is often characterized by mumbling) makes communication with others difficult. 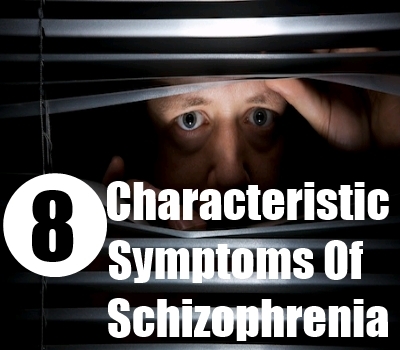 One of the positive symptoms observed in patients diagnosed with schizophrenia is hallucinations. This particular term ‘hallucinations’ refers to feeling, viewing, hearing or even smelling things or people that do not exist in real. In short, what such patients see or hear is nothing but a part of their imagination, which they believe as true. The is the precise reason why this symptom is termed as a ‘positive’ one. According to the National Institute Of Mental Health, there are many types of hallucinations, of which auditory hallucinations have the highest incidence rate. In such cases, patients begin to hear sounds, particularly voices that are not heard by unaffected individuals. Patients further report that the voice they hear sometimes pre-warns them about an imminent danger, talk to either them or another voice and may even instruct the schizophrenic patient to do or say something. Other types of hallucinations include visual, tactile or olfactory hallucinations. Sometimes, patients diagnosed with this mental disorder claim that they sometimes feel the touch of invisible fingers and even sense a wave of electrical impulse rushing through their body. Other negative clinical symptoms seen in the condition of Schizophrenia include poor level of personal hygiene and many a time, inept, self care. Affected people often wear soiled clothes for days or entirely forget to take a bath, or even shampoo their hair. In short, they are not able to keep themselves well groomed and do not seem to understand the unfavourable consequences of not staying presentable on a physical and social level. Grandiosity refers to a delusional state and is mostly seen in individuals suffering from mental disorders, schizophrenia being one of them. Owing to this disorder, they are incapable of distinguishing between reality and misconception. This has a negative effect on both, professional as well relationships shared with near and dear ones, especially of they start behaving in an aggressive manner. At first, schizophrenics have a tendency to be secretive about grandiose thinking. However, strong pseudo beliefs and talks about having extraordinary powers etc are soon noticed by those in his or her vicinity. Catatonic behaviour can be clubbed under several, different categories which have been described below. He or she may show extremes of behaviour, such as absolute physical or motor immobility or excessive physical mobility. During motor immobility, the affected person shows no response or reactivity towards his or her surroundings, almost similar to stupor like state. Some of them exhibit an excited or restless behaviour wherein they begin to walk or pace around in a haphazard manner, speaking aloud or swinging their arms continuously. Such type of catatonic phases go on, uninterrupted for long hours, and in rare cases for many days at a stretch. Other symptoms noticed during such episodes include saying a single word or sentence over and over again (this is known as echolalia) or mimicking or gesture or movement made by other people (called echopraxia).